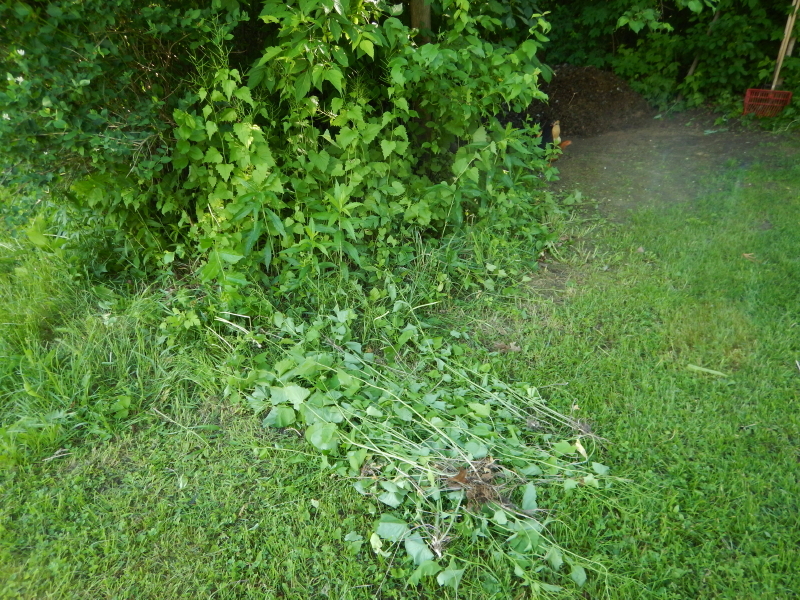 Historically, I have been much less inclined than Cyndie to worry about identifying and controlling all the multitudes of potentially problematic invasive plants that loom as threats to our fields and forest. My main beef was with the Common Buckthorn tree. Cyndie had discussions with an agent from the county extension office who pointed out many other troublesome plants, first hand, on a visit to our property. I quickly got on board against one other invader when Queen Anne’s Lace grew to dominate our hay-field. A review of the Wisconsin DNR invasive species photo gallery provides a whopping 118 examples of potential problems. I find it too much to bear. 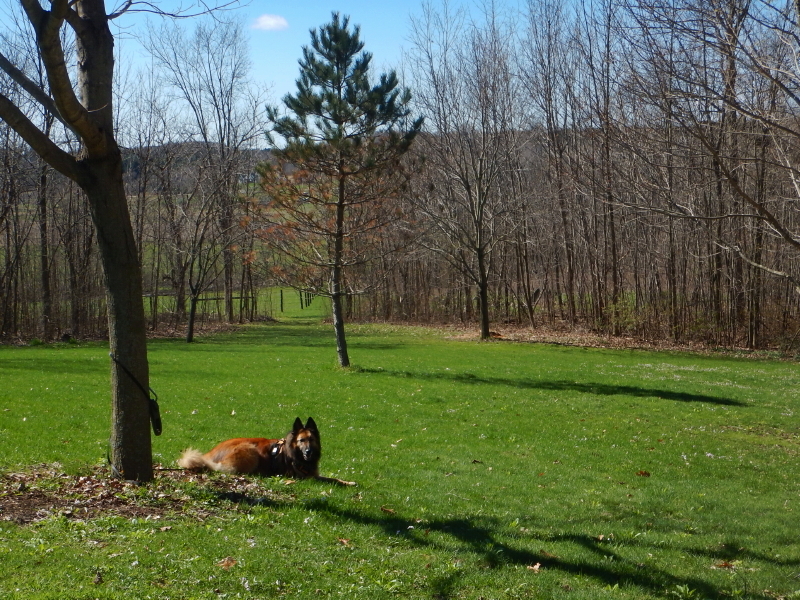 Cyndie is able to focus on battling dandelions in our lawn, where I see the effort futile. This translates to most other plant invasions as well, so when she would verbalize concern about the dozens of other threats appearing around every turn, I would tend to glaze over and save my focus for challenges already known. 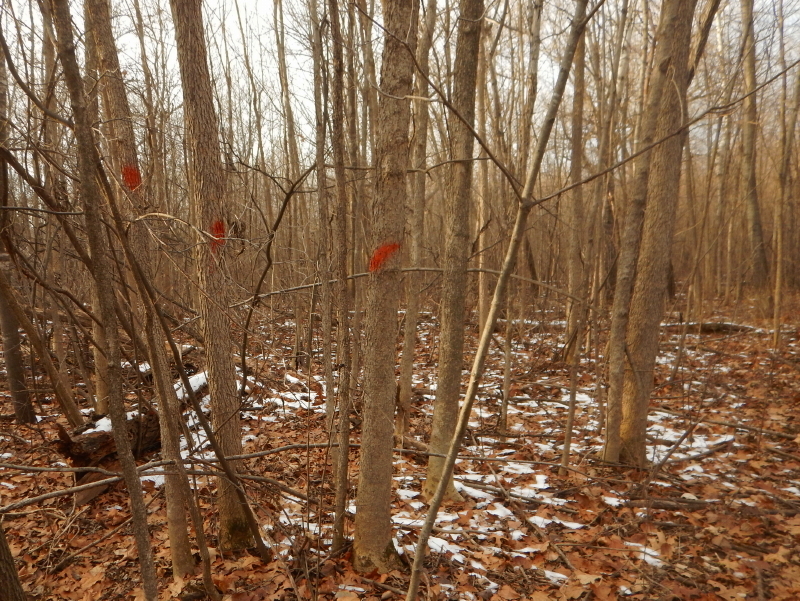 In the fall, when all the leaves have dropped, except for the Common Buckthorn, I kick into a high gear of eradication. In the spring, when the leaves haven’t sprouted yet, except for the prickly bushes that drive Cyndie nuts, she wants to do the same. I wasn’t so inspired, until she spent time to identify the thorny pest. When she came upon the Prickly Currant, one detail got my attention. It plays the role of host for a blister rust that kills pine trees. Well, why didn’t you tell me that in the first place? Now I care as much as her about not wanting these painfully prickly nuisances growing everywhere. 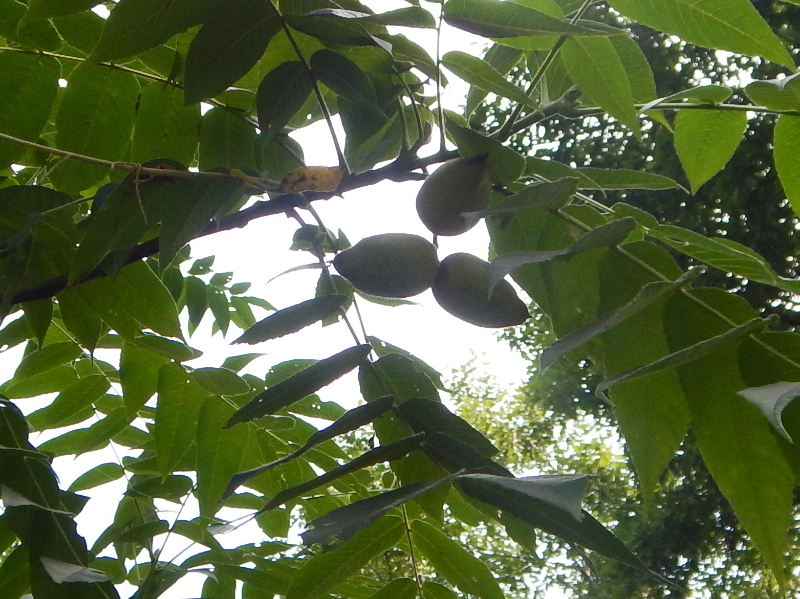 Once I started looking for them, it became clear the bush is thriving on our land. 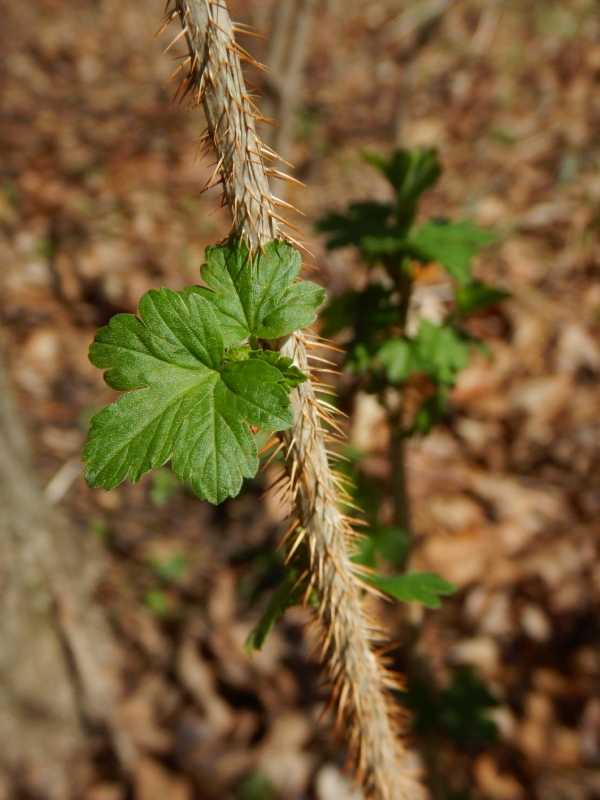 It is very easy to spot this time of year, as the leaves are some of the first to appear. Luckily, I discovered they are relatively easy to pull out of the ground. It grows a lot like the raspberry bushes, with the long sprouts drooping over to the ground and taking root in a new spot. Since the stems are so thorny –worse than the raspberries– it makes for a very annoying hazard when walking off the trail, like one might do when hunting to pick berries. We spent much of yesterday pulling and digging to extricate a surprising number of these stabbing hazards along the edges of our back yard, where there used to be about ten more lovely pine trees, back when we bought this place. Now there are only two on the back hill, and they aren’t looking very good. I never imagined how much knowledge and effort would be involved in being a good steward to manage what grows on the land. I figured nature would take its course and come to a healthy balance. Unfortunately, one plant’s ‘healthy’ can often lead to another’s demise. To protect the plants you desire, a little lethal effort is sometimes going to be required. I am enjoying renewed respect for Cyndie’s capacity to comprehend and react to all these details which too often overload my mental resources..
Now it’s time for me to go fret over getting all our grass mowed. Sometimes a simple walking of the dog through the woods feels more like a reconnaissance mission of surveying the ever-changing status of our property. Certainly, after a few days of strong winds there are changes to be expected, but I’ve been surprised more than once about how easy it is to miss what eventually seems to be obvious. Did this tree make a sound when it toppled? We didn’t hear a thing. I expect I may have walked past it one or two times in the days since the gale force gusts blasted us for hours on end last week, but yesterday as I joined Cyndie and Delilah for morning chores, I spotted it immediately as we approached. 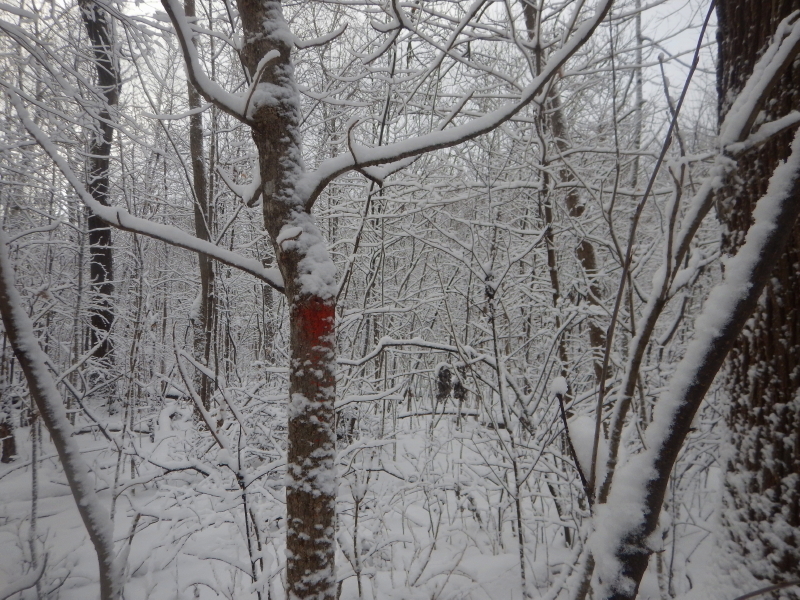 It fell in a perfect direction to avoid getting hung up in any other trees and pointed away from the trail. With all the other downed wood from our days of tree trimming awaiting attention, it’s possible this old poplar will be left where it lays for nature to process. 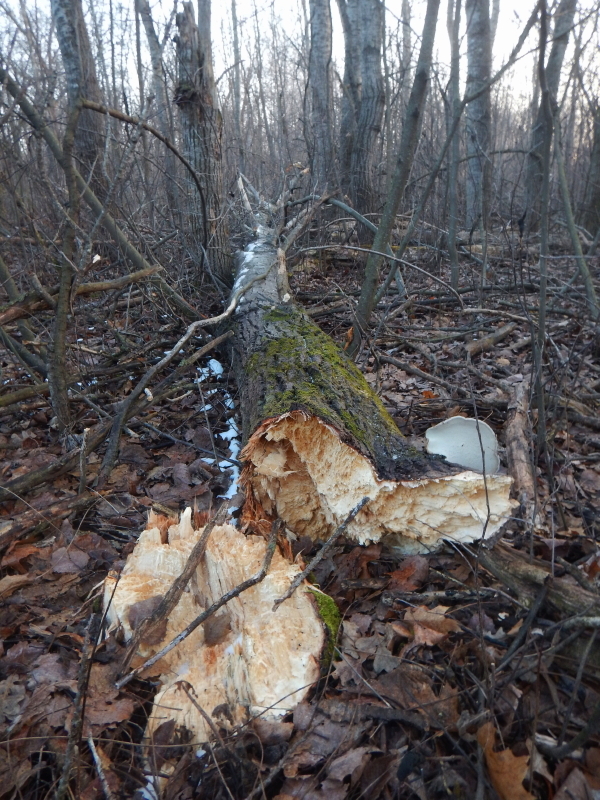 If we were intent on cleaning up downed trees and branches throughout the full extent of our meager stretch of forested acres, it would be more than a full-time job for us. 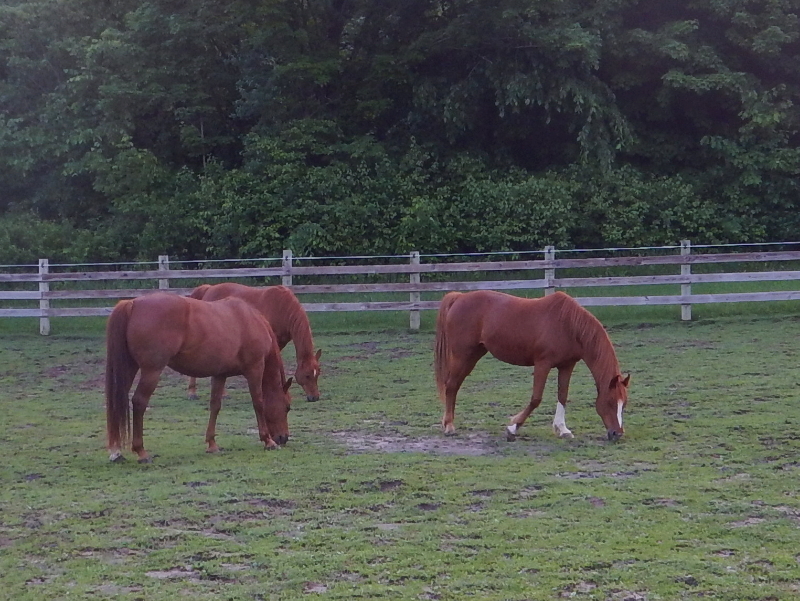 In the last couple of years we have focused our attention on the patch of trees closest to the house by the barn and back pasture, picking up dead wood that has made its way to the ground. This is the time of year, before green leaves obscure the view entirely, when the extent of branches brought down over winter is so easy to spot that it intimidates. There is so much to be picked up. It doesn’t give any impression of our having done so last year. That is, until one strolls through the forest at the west end of our land to see how much is on the ground where nothing has ever been picked up. 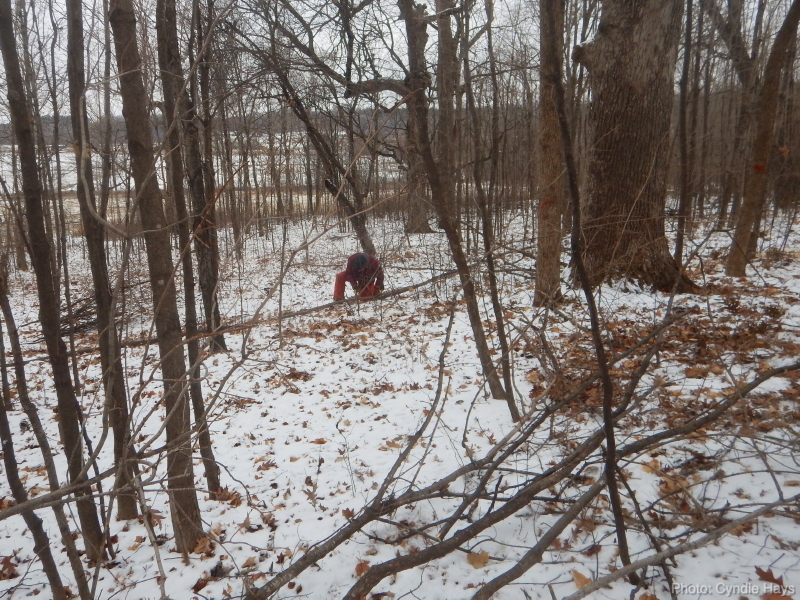 I wonder what a year-long time-lapse recording of the trees and ground in our woods would look like. Timed right, I bet it would appear to be raining limbs and branches. 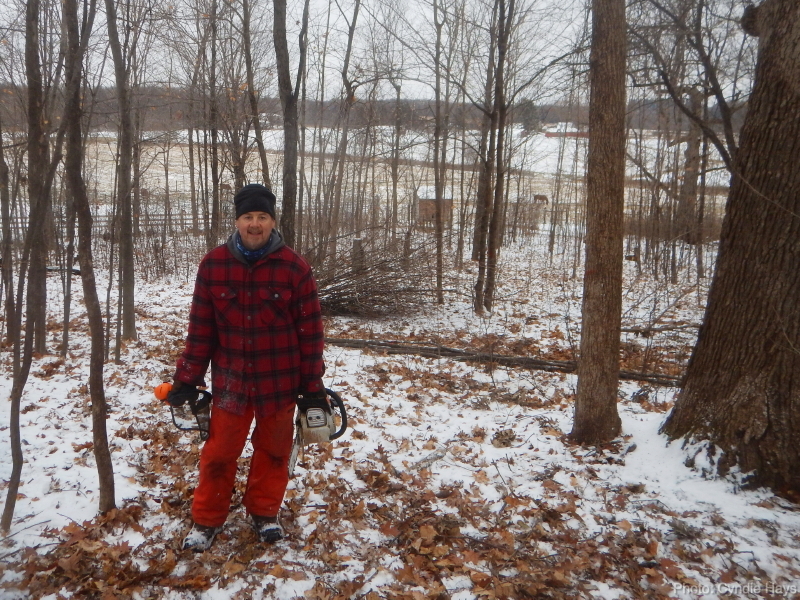 I’m home from work today to guide tree trimming work on our property. It has been over a year since we wanted this to happen, so we are very pleased the project will finally be getting underway. On my drive home yesterday, I received a call from the arborist who quoted the job. I wasn’t surprised to hear that they are now unwilling to bring the bucket truck due to the melted ground from the warm temperatures lately. They don’t want to risk getting stuck in mud, which is okay with me, because I don’t want to risk having the trails significantly messed up by a heavy truck. However, I am disappointed over the implications they won’t be able to trim as many trees as I had wanted. The bright side of that is, it will create less work for me in the realm of chipping, cutting and splitting the branches that will be on the ground when they are done. Part of me is lamenting the time and effort I spent a month ago plowing and shoveling to make sure the routes through the woods would be wide enough for their truck. I didn’t know at the time that it would take them this long to fit us into their schedule, or that the weather would be so summer-like that snow wasn’t a problem by the time they arrived. Our tree guy did mention that instead of the truck, they will bring a lift that will help to a lesser degree. The less time they spend climbing is the more time they can be cutting. I expect most of my day will be spent standing around gawking, and getting very little else of value accomplished. I want to be present at all times to guide decisions and direct priorities, so the day won’t be conducive to my digging into any other chores. 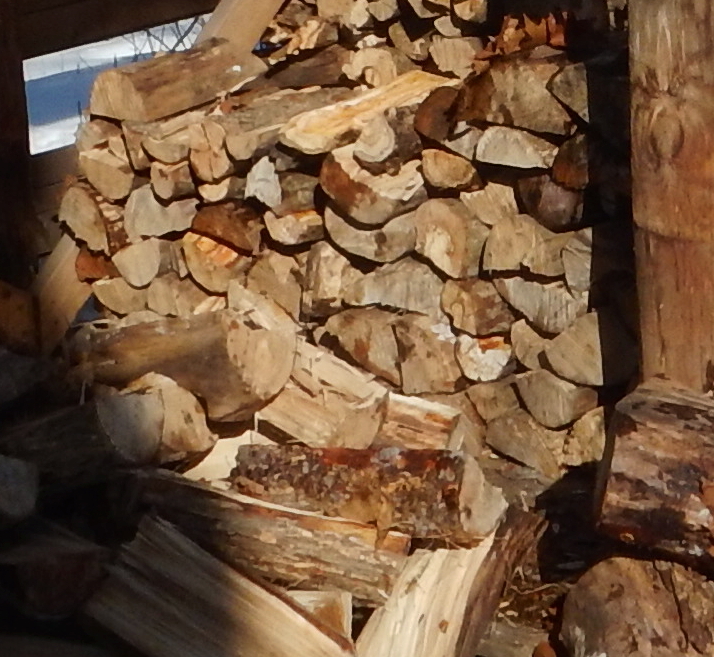 I suppose I could dabble in some wood splitting when we are back by the shed. It would certainly be a complimentary task to the professional trimming going on overhead. We’ll be toiling away to make our trails safe again. It’ll be a win-win project, because in addition to safety from unexpected falling limbs, the trimming will make our trees more healthy and improve their odds of surviving wind and storm damage. It’s expensive, but I think the investment will be money well spent.